I'm very new to this forum and all this info is overwhelming to me! So pardon me if this has been asked, and maybe someone can direct me. I have a Sprint Galaxy S3 using a micro SD card that was from a previous cell that I had for 3 years! I just used the same micro SD from my old cell and popped into my Galaxy S3. I haven't done anything to unmount my micro SD card, and all of a sudden my 2 apps that were saved on there and all my pics, downloaded music, and videos couldn't be accessed. So, I panicked, popped it out and loaded the SD card onto my card reader and into the PC and I now can't view any of my pics, music and videos on that SD card. I wanted to copy it all and paste it onto my pc's external hard drive. 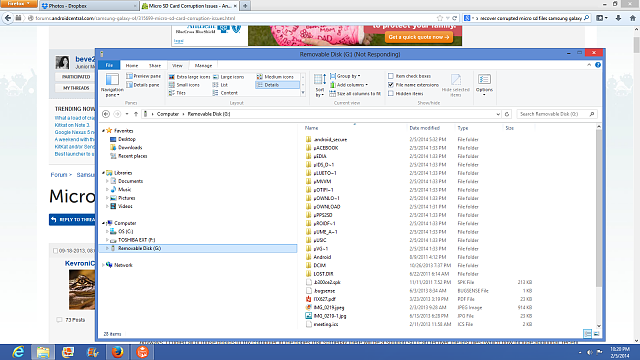 This is what my folders are looking [ATTACH=CONFIG]103584] like when I pop my SD card into the reader into the PC. My folders are labeled with jibberish. When I click on them, I cannot pull anything up....no pics or anything. Then, I popped it back into my Galaxy and I was able to access just my pics and videos - no music - and I'm currently backing it up onto my onto Dropbox....but I still want to copy all and paste onto my pc external hard drive! 1. Does anyone know why I can't access my pics, videos and music on my PC? 2. Do you think a photo recovery software will recover on my pics, videos and music on my PC so I can copy it all to my external hard drive? Could be corrupted file, try to do a disk scan on it. Right click -> Properties - > Tools -> "Check now" button. Let it to scan and fix errors. If the scan is successful try to copy the files to your pc. If not, maybe that microSD is permanently damages. 3 years is about the right time for it to go. What version of Android will come on the S5? Does anyone know of a Andorid Apps Blacklist? If not, are there any apps you'd put on it?